Fans of Dragon Ball Z is going to be happy with this news. And finally a game where will we be able to make a Kamehameha with our own hands. Could it be true? Of course, thanks to Kinect sensor we will be able to relive again the epic battles of one of the best anime such as Dragon Ball Z. And after you see this trailer for Dragon Ball Z Kinect, you better put to practice the pose of your favorite technique. The gameplay in Dragon Ball Z Kinect is the most interesting, being able to experience each movement with our own hands. Kinect sensor will allow us to throw pineapples, kicks and balls of energy in a first person perspective. Also we avoid such attacks only move to one side, bending down to reload Ki and even can fly with only jump. Conducting special attacks like the Kamehameha and Goku's Genki Dama, which will be such as we have seen in the anime, having to pose for. And if you forget this pose, an option will be displayed on the screen to do it. 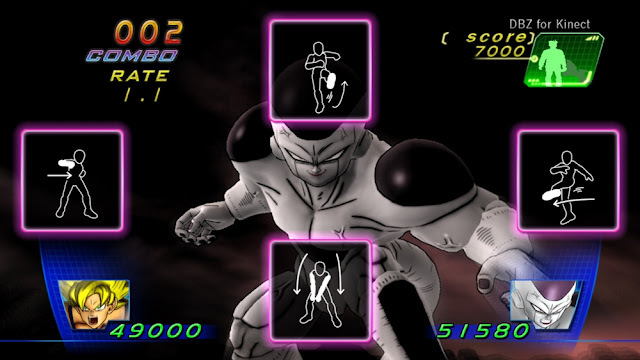 In Dragon Ball Z Kinect return once again to revive the legendary battles we've seen time and again in the anime. Story Mode will cover the four main sagas: the Saga Saiyan , Frieza Saga, Androids Saga and Majin Buu Saga, choosing from more than 50 characters, including transformations and the novelty of an entirely new. In addition there will be more than 100 movements that we can learn and perform with your hands. At last we can feel the excitement of launching a Kamehameha with our own hands. While the idea of a game of Dragon Ball Z with motion sensors is not new in 1994, he left Dragon Ball Z: Virtual Reality Versus Sega arcade machines, then the System 32, incorporating motion sensors that allowed the player to move his body to control the character in the game, a very limited way, of course. But aside from that, the title will come with a surprise, as did Dragon Ball Z: Rising Blast 2: Special Bardock TV episode that took place last year. Dragon Ball Z Kinect is being developed by Spike Chunsoft and available for the October 30, 2012, being an exclusive title for Xbox 360. As promised, Sony has confirmed on its official blog that can already be downloaded for free from the mobile YouTube application, as announced at E3. As part of its plan to provide support to PS Vita and complement it with new features, Sony has confirmed that it is available completely free YouTube application for your laptop. Favorites: A list of videos that have been added to the list of favorites. You must be logged in to your account to add a video to your favorites. Users can enjoy videos in two modes, full screen and small screen, it just depends on how they prefer to see the viewing. The full screen will have a control panel that allows you to easily expand or minimize the videos. You will also have a button that will use so that it can switch to HD high definition 720p. On the small screen may be showing video add-ons, that is, the extra information of the video and comments from these.